What Is Spanish Orxata Made Of? Horchata (or Orxata as it is called in the Catalan) is a popular non-alcoholic drink from Valencia, Spain, which is popular throughout the country. Do not confuse it with horchata from Mexico or Central America, since there is a difference, although they look similarly like milkshakes. There is confusion over what horchata is made of mainly because there are two types. There is a rice-based horchata, which is a popular drink in Mexico and other parts of Latin America, and horchata in Spain that is made of water, sugar, and tiger nuts. Spanish horchata has a uniquely different taste than the Latin American version, which tastes more like rice pudding. In Cordoba, Spain, an almond variety is popular, particularly in the summer months. This is called horchata de almendras. No tigers were injured in the making of the tiger nut-based drink, nor were nuts used. Tiger nuts, called chufas in Spanish, are actually a weedlike tuber called Cyperus esculentus. Horchata is suitable for vegetarians, vegans, and people with nut or dairy allergies. Due to its chemical composition, tiger nuts share characteristics with tubers and with nuts. It has been reported to be a health food since its consumption can help prevent heart disease and thrombosis and is said to activate blood circulation and reduce the risk of colon cancer. This tuber is rich in energy content (starch, fat, sugar, and protein), minerals (mainly phosphorus and potassium), and vitamins E and C.
Horchata (or orxata) is available throughout Spain. Horchata is typically drunk at merienda, the late afternoon snack that is intended to carry you over from lunch to a usually late dinner. Many bars make it themselves and will display a sign saying that they have it, by saying, "Hay Horchata" in Spanish. Street stalls selling cold drinks also often sell horchata (they are normally the same stalls that sell granizado, which are like shaved ice or slushies). Horchata also comes prepackaged in stores, but it tastes nothing like the homemade version. While in Valencia, after you've had Valenciana paella, don't forget to stop at horchateria. Like the name implies, horchaterias are vendors that specialize in horchata. The most famous is opposite the Iglesia y Torre de Santa Catalina at the corner of Plaza de la Reina. Since there is very little variety of ingredients, there is barely any difference between the horchatas that you can get from one cafeteria to another. As long as it is cold and made fresh, on-site, it will be as good as any other. 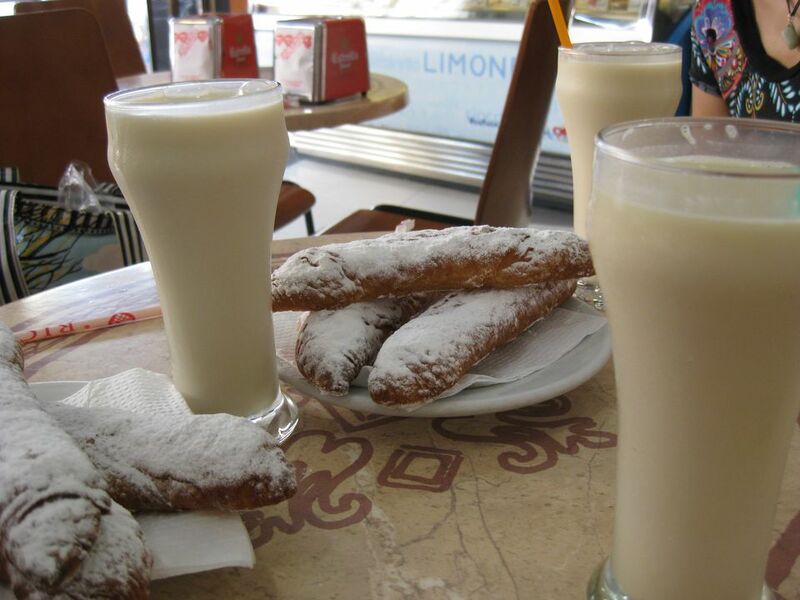 Sweet pastries that are made to be dunked in your horchata beverage are called fartons. Longer than lady's fingers, these elongated, sugar-glazed pastries are very sweet. They are made of flour, milk, sugar, oil, and eggs.